All Aspects - Carpenter based in London, Greater London. Hello, my name is Paul Volke. 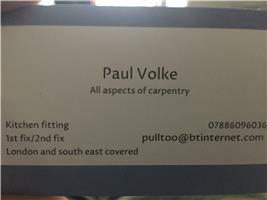 I am a carpenter and joiner and have been since I left school and began a 3 year apprenticeship. On finishing my apprenticeship I have worked for the same company for over 15 year's on all aspects of carpentry commercial and domestic, big and small. However the last couple of years I have started to do a few projects of my own and am slowly starting to do my own thing full time. All works undertaken 1st and 2nd fix. I am happy to work in all environments working alongside other trades and am always happy to work around the client so can make myself available at evenings and weekends.